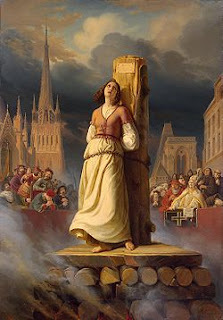 Joan of Arc was burned at the stake on 30th May 1431. I knew the basic outline of her story from school. Reading over it again, her lifestory really is amazing. I love the fact that a sixteen year old girl could succeed where experienced generals had failed. There are varying opinions as to what she actually did during the battles. Some historians say she merely held the Standard and boosted morale. But others take quotes from eyewitnesses who say that she lead her troops into battle. Whichever it was, there is no denying that her tactics won the battles for the French. Like, wow! Every woman has the problem of what to wear, even if it is into battle. Joan went for the totally functional option of male attire- armour and a short haircut. This would have also made it more difficult for her to be raped. I was dumbfounded to learn that the technical reason for her execution was that she broke a biblical clothing law. So she died because of what she wore. What would they make of Lady Gaga? The whole "burning at the stake" reminds me of a conversation I had during the week. I was going into the shop in my village when I met Frank, a local farmer. We opened our conversation with the normal topic - the weather. "Morning, Noeleen. That's a damp morning. Big change from last week". "Sure is. Last week was glorious". "Ah, it was too hot for me. But I suppose you loved it, you havin' lived in the desert"
"I sure did. It can't be too hot for me. You know, I think I'll get on great in Hell!" "I bet the divil will stick you in a fridge!" Now that would be my idea of Hell!